Intercom systems form a key part of physical security. They include commercial and at-home installations consisting of door stations, master stations and emergency stations. IP-based intercoms combine voice and data over an IP network, eliminating separate wires for audio and video, while adopting Power over Ethernet (PoE) removes the need for separate power cabling. Want to speak to an expert? Contact your local Microsemi sales office today to learn more. 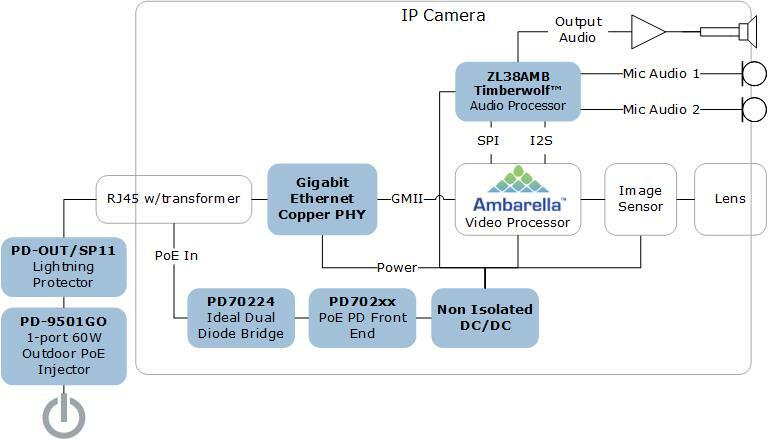 Microsemi’s Timberwolf audio platform is a third-generation Digital Signal Processor (DSP) with a proprietary 4-MAC core and dedicated hardware accelerators. Ideal for supporting the growing need for low-power hands-free communications, Timberwolf is a field upgradable platform enabling multi-channel Acoustic Echo Cancellation (AEC), direction of arrival and far field mic capabilities and beam forming, when combined with algorithmic firmware. Microsemi offers the broadest portfolio of indoor and outdoor PoE ICs and systems for cost efficiently powering your audio video intercom applications. With industry leading solutions for any PoE situation, Microsemi’s PoE switch portfolio enables delivery of up to 95 watts of flexible and reliable PoE to master stations, WLAN access points, VoIP phones, IP cameras, thin/zero clients and other Ethernet devices. Our broad physical layer PHY portfolio includes cost-effective SimpliPHY™ industrial grade Fast Ethernet copper PHYs supporting 10BASE-T & 100BASE-TX connectivity. Need help finding the right solution for your needs? Contact your local Microsemi sales office today to learn more. With IP-based intercoms combining voice and data over an IP network, using Power over Ethernet is key to simplifying your network management and deployments. Microsemi's broad portfolio of Power over Ethernet systems enable cost-efficient powering of your audio video intercom applications. Our industry leading PoE switch portfolio enables delivery of up to 95 watts of flexible and reliable PoE to master stations, WLAN access points, VoIP phones, IP cameras, thin/zero clients and other Ethernet devices. Want to speak to an expert? Contact your local Microsemi sales office today. Microsemi works with its Accelerate network of ecosystem partners to integrate, test and deliver pre-validated board or system solutions in our core vertical markets, such as industrial, to expedite our customers' time to market. See Microsemi's available reference design platforms for physical security/IP surveillance systems.